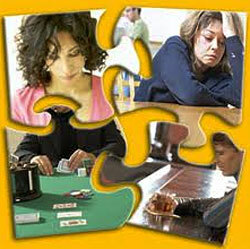 Everyone who has collided gambling addiction want to do something, to help somehow. Some of them starts yelling at the person, who spends lots of money at the casino, another just don't talk with the addict, and there are few persons who really approach to this problem from a right side, and rationally and comprehensively try to provide an effective help to those who need it. They'll tell you that addiction is the only outcome to avoid other more destructive problems. If you start passing this way of a real help for the addicts you must be strong and long to provide such kind of aid. Willpower is the first thing that both of you will need in the battle with addiction. Be prepared, and start to act! You have to establish trust. Even if the gambler has really ruined your trust to him, you have to renovate it again. The addicts may think that you just want to control them, and this can be converted into the stronger wish to gamble. You have to create really trust atmosphere, without any stressful outburst. Be vigilant! Help yourself. Don't concentrate totally at the addict person; you also need help to overcome all this. You have to accept that you are about to go through the real stress: learn to dismiss steam, to relax and to give a support in a right way. Communicate step. You'll wish for sure to show all your displeasure towards somebody's addiction, but you really have not to guilt him or her. You must speak with them honestly and frankly but in such a way that they start to think about their behavior. Treatment. If you have convinced the addict that he\she really needs a help and you've applied for a specialist, in this period you have to support the addict maximally. Try to remember the first three steps again and just know that if you want to change the addict you have to be changed too. You have to remember that change is not something quickly; you will wait long time until you see some result. Be gritty and good luck!